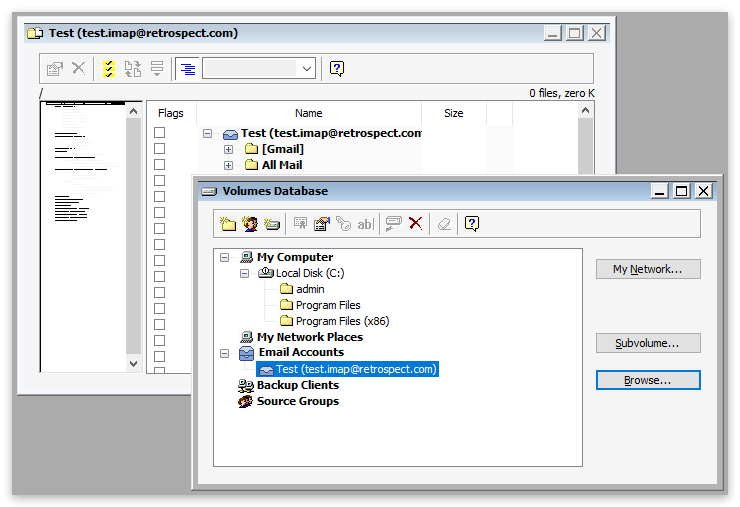 Retrospect Backup 15 introduced Email Protection for IMAP email accounts. With Email Protection, IT administrators can protect every email on their organization, with global deduplication, fast migration, and restores for individual emails, folders, or entire accounts. Retrospect Email Protection is fully certified for Microsoft Outlook.com, Microsoft Office 365, and Microsoft Exchange mailboxes. However, Retrospect Backup continues to support Microsoft Exchange on-premise protection via the Microsoft Exchange add-on and individual client PST file protection. Let’s walk through the trade-offs. Retrospect Backup Exchange Agent add-on provides hot backups of Microsoft Exchange Server 2019, 2016, 2013, 2010, 2007, and 2003 storage groups, databases, and mailboxes. It allows Retrospect to automatically restore an Exchange Server or individual components to a specific point in time. The Microsoft Exchange Agent add-on is licensed for use on an Exchange Server running either the Retrospect application or as a Retrospect Client. The add-on is designed for protecting on-premise instances of Exchange, so it’s the best choice if that is your current configuration. For hosted versions of Exchange and Office 365, you should consider Retrospect Backup 15’s new Email Protection license. Retrospect Email Protection is a perfect solution for protecting email accounts. It uses global deduplication to ensure emails that are sent to multiple accounts are only stored once but can be restored to any of the accounts. You can migrate individual emails or entire accounts to different accounts or even service providers. Retrospect Backup only requires an email license to protect that email account or the unlimited email add-on to protect an unlimited number of email accounts. However, Retrospect Email Protection is specifically designed for IMAP email account protection. IMAP does not have a notion of calender events or contacts, so Retrospect Backup cannot protect calendars or contacts on Microsoft Exchange or Microsoft Office 365. If Retrospect Backup does not support your version of Microsoft Exchange or you prefer to protect individual PST (.pst) files, Retrospect Backup can easily protect PST files across your organization. Because PST files are generally large, it utilizes block-level incremental backup (BLIB) to back up only back up the parts of the PST files that have changed, saving time and space during repeated incremental backups. Open-file backup with VSS is essential as well to ensure Windows takes a complete snapshot of the PST file. Retrospect Backup only requires a client or server license and Open-File Backup Add-on to back up the client machine or server to protect the PST file there. The trade off is you cannot restore individual emails from a protected PST file. You will need to restore the PST file completely and then load it into Outlook to access the requested email. You do not need to protect the OST (.ost) files. These are temporary files that will be recreated if Microsoft Outlook detects it is not present.